The small hamlet of Knedlington has a surprisingly interesting history. For example, on 20th August 1602 the Howden parish registers record that ‘Elizabeth, a wi[t]ch, died at Knedlington’. Who was this mysterious Elizabeth? What made people think she was a witch? And how did she die? Knedlington is an early Anglo-Saxon settlement and is first mentioned in the year 959 as ‘Cnyllingatun’. The site was probably chosen by settlers for its good quality land. In Stuart times Knedlington was the home of the Arlush family. Stephen Arlush, born in 1625, was educated at Cambridge. He was a nonconformist minister and during the Commonwealth period when Cromwell was in charge, he was appointed the minister of Howden church. He was removed from the living in 1662 for his Puritan beliefs but continued to preach for a time in a house in Pinfold Street. 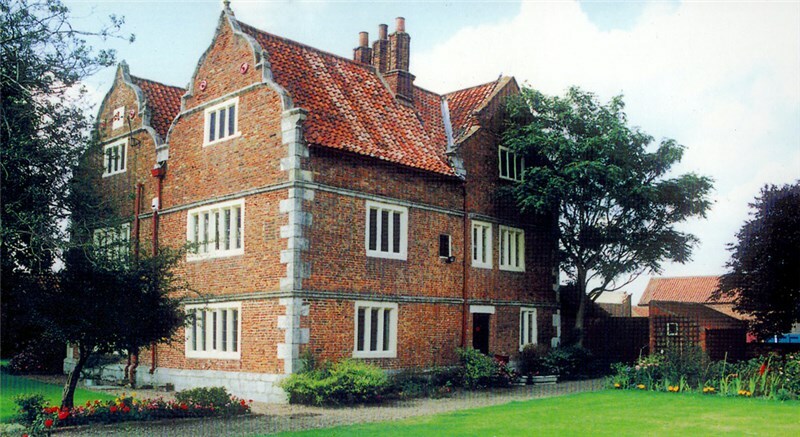 It is believed that Stephen Arlush built what is now Knedlington Old Hall in the 1660s. The house is described in Nikolaus Pevsner’s famous architectural guide as the finest small manor house in the East Riding. Stephen’s son Nathaniel inherited the estate and after he died in 1697 his widow Ann married Rev. Samuel Terrick, rector of Wheldrake. Their eldest son, Richard, rose high in royal favour, becoming chaplain to King George II and later the Bishop of London. Through the Arlushes, the Weddells of Newby Hall later inherited Knedlington and tenants occupied the hall for most of the 18th century. Knedlington was a village which bred families with fiercely-held and sometimes dissenting religious beliefs. For centuries there was a Quaker burial ground in the village, although it was ploughed up during the Second World War. In the late 17th century two Knedlington Quaker families emigrated to America so that they could worship freely. Samuel Wright, a Knedlington yeoman, was imprisoned for refusing to pay towards the wages of the Howden parish clerk as it was against his Quaker faith. He emigrated with his two brothers and their families in the 1670s. On the same ship was William Goforth of Knedlington and his wife Anne, also Quakers, whose mother later died in York Castle having also been imprisoned for her religious beliefs. By the early 19th century the Knedlington estate had become the property of the Clarke family. The coats of arms of both Terrick and Clarke are carved in oak panelling in the Old Hall. Thomas Clarke owned much of Knedlington, Asselby and Barmby and in 1841-2 he built a new hall which he called Knedlington Manor. It consisted of 33 rooms and was designed by Weightman and Hadfield of Sheffield in the Tudor style. There were formal grounds containing several American trees grown from seeds imported by William Cobbett, the famous 19th century pamphleteer and horticulturist. Clarke was prominent in local affairs and was involved with the restoration work of the church, the building of the Howden workhouse and the Shire Hall. His son Thomas Sinclair Clarke inherited the estate and after his death a drinking fountain was installed in 1901 at the corner of Boothferry Road and Howden Road in Knedlington, nearly opposite the front gate of the manor. It carried the family coat of arms and the exhortation ‘Drink, weary traveller and give also to your cattle’. 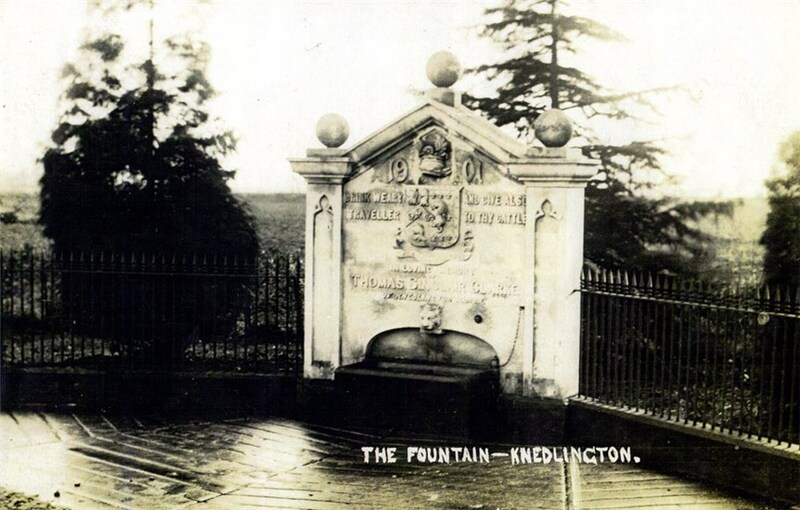 The fountain was a familiar sight to many Howden people, particularly to those who travelled on the EYMS bus to Goole as this was where the bus stopped and passengers could look down at the stone trough – although in latter years it was dilapidated and full of leaves. It was eventually broken up and local tradition says that it became part of the foundations for the M62. In 1918 twenty German POWs came to Knedlington to erect tents in the manor grounds. These tents were used by fifty cadets from Ampleforth who came to help pull flax, which was grown locally and was a key component of aircraft wings. After Mr and Mrs Clarke’s death, the Knedlington estate was sold to James ‘Jimmy’ Mortimer. Mr Mortimer had bought the airship station where the R100 was built and in 1931 he played host at Knedlington Manor to Dr Hugo Eckener, commander of the Graf Zeppelin. It was planned at the time that airships for the Transatlantic routes could be built at the disused airship station, but nothing ever came of this. When Mr Mortimer moved to Howden Hall, he sold the Knedlington estate to the Earl of Yarborough and it then passed to his daughter, Lady Diana Miller. Knedlington Manor was finally demolished in the 1950s. Of the other houses in the village, Knedlington House in the mid-19th century was the home of Rev. George Richards, an Independent minister. He used the house as a boarding school for ‘young gentlemen’. It later became the home of the Jubb family who were market gardeners. Knedlington also had an inn called the Anchor on the south of the village street, run for many years in the 19th century by the Waterhouse family. In the 20th century the village was the home of composer and organist Friedrich Muller and descendants of the Cass family. William Cass had been Goole’s first doctor and, as a student, went whaling out of Hull. We are greatful to local historian Susan Bulter for kindly allowing use of her work. Knedlington Old Hall in its present form is believed to have been built around 1660-1670. In 1851 Knedlington Old Hall was occupied by Edward Thompson, farmer of 230 acres, his wife Ann, their six children, three female house servants and two male farm servants. The Thompsons were still there in 1861, but by 1871 the tenancy had been taken by Thomas Fentiman. He and his wife Elizabeth lived at Old Hall with their son John, a young nephew, John Keniwell, a governess, three farm servants and one domestic servant. By 1891 the Old Hall was lived in by Richard Barker, farmer, his wife Elizabeth, a domestic servant and three farm servants. The Barkers were still living in Knedlington, presumably at the Old Hall, in 1901. A survey of 1910 names Cyrus Howden as tenant of the farm. Cyril Blea of Asselby worked at the Old Hall Farm from 1940 to 1963, the year before the Old Hall was "modernised" internally in 1964. Cyril Blea recalls that the Old Hall had a bathroom and internal plumbing fitted in 1941. Cyril lived in the Old Hall for some time, I think he married during his occupancy there. The farm manager was William Waudby. From 1964-2001 the Old Hall was occupied by Ken Everatt. He said there was a secret passage somewhere in the house opening to the alleged tunnel from Howden Church to Wressle Castle. This tunnel was a regular talking point amongst the local children, but nooone knows if access within Old Hall really existed at all. Cyrus Howden's wife was a Backhouse - of the same family of the garage at Airmyn - and lived at Prickett Hill Farm between Wressle and Brind - now demolished. Apparently there is a bound book containing a history of Knedlington and the Old Hall, and it was in the care of the Backhouse family, possibly the brother of Cyrus Howden's wife, at Prickett Hill. The book was not included in the auction sale of the contents of Prickett Hill Farm when it was about to be demolished and its whereabouts is still unknown.